The Port's attractive and efficient Cruise Terminal has a range of facilities including telephones, bar/cafeteria, arts and craft shops, display areas and a Gibraltar Tourist Board Information office. Cruise ships dock only about 1.5 km from town. A 15 minute walk. 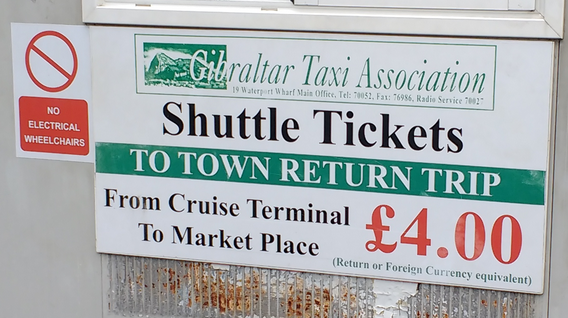 Shuttles (mostly mini vans - the wait can be long) are offered by the port as well (3 £ one way, 4 £ return), as well as taxi's. 4 £ per person one way. When you first see the Rock of Gibraltar, it is its impressive stature, towering isolated above the surrounding countryside, that causes the greatest impact. It is a narrow peninsula linked to the end of the Iberian Peninsula by a narrow sandy isthmus. Gibraltar is less than 7 square kilometers, so most of it can be seen on foot. Bear in mind, though, that some of the roads (especially up to the Upper Rock) are very steep. Taxis will take the strain out of the climbs, and all the taxi drivers seem to know all the apes by name. Do not miss very short runway. The feature of this run way is that a public road runs across it. They are working on a tunnel. But for now, the traffic has to be stopped on each side for landings. The name Gibraltar is the Spanish derivation of the Arabic name meaning "mountain of Tariq." Cable cars run from 9.30am until 5.45pm to the Upper Rock. 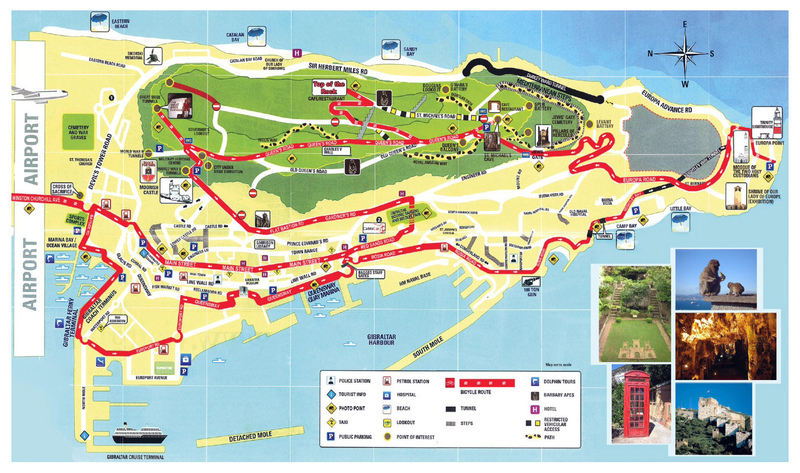 A "cable car and apes" ticket costs £13 return, while a ticket including entrance to St. Michael's Cave and the Siege Tunnels costs more and will require some walking and climbing. Alternatively, a 'Taxi-Tour' (typically for 8 people in an MPV) will cost £22 for a 1.5 hr tour, and this includes the fees for entry to the Cave, tunnels and upper rock. Taxis will often tell you that the cable car is broken, do not believe them! These tours leave from the cruise terminal. So if you just want to see the apes and enjoy the view, take the cable car, otherwise take the guide tour to see all. Watch your belongings, the apes can be very aggressive. In season there can be long lines at the cable-car. Thrill-seekers will have a new reason to visit Gibraltar, where work just finished on the installation of a 71-metre-long suspension bridge across a 50-metre-deep gorge at Anglian Way in the Upper Rock. Although Spain is very close, Spanish border controls are very cumbersome and traffic jams at the border are long and frequent. Main Street, about a kilometer long with its adjoining lanes and byways offers a large selection of goods, often duty-free, and with truly british character, including "bobby's". At the and of Main Street is the cable car station. Tobacco prices are often cheaper in the tax free shop of your ship. Alcohol is dirt cheap in Gibraltar. Gibraltarian notes and coins are not legal tender in the UK. Gibraltar residents speak English and Spanish. Free WiFi at the Burger King on the main square.